Celebrate Small Charity Week with us! We’re really pleased to be joining Small Charity Week (13th-18th June) again this year and want to invite Dudley borough’s small charities to help us celebrate and put your organisation and Dudley on the map! “Small Charity Week celebrates and raises awareness of the essential work of the UK’s small charity sector who make an invaluable contribution to the lives of millions of individuals, communities and causes across the UK and the rest of the world. The FSI defines small charities as charities and CICs that have an annual turnover of under £1.5million and we know that that will cover a lot of community organisations in Dudley borough, because the overwhelming majority of charities are small. Monday 13th June – join the #ILoveSmallCharities celebrations on Twitter, Facebook and Instagram by by posting a photo of yourself holding a poster showing why you love your small charity? You could get your members and supporters to join in too! And doing so could win your charity up to £450 in the process. Visit the #ILoveSmallCharities page for more information. I’ll be joining in by posting some stories here about some of the small charities I’ve recently supported. And if you can’t make it, we’ll be monitoring our Twitter, Facebook and this here blog so that you can ask questions virtually. On Policy Day, Wednesday 15th June, our friend and colleague Donna Roberts will be sharing how Working Together for Change, Dudley borough’s parent-carer forum, has successfully worked with and influenced decision-makers in the design and delivery of local services. Look out for her hints and tips on this blog. Thursday 16th June is Fundraising Day – you’re invited to Synergy, the peer support network for Dudley borough’s charities and social enterprises, organised by our friend Andy Mullaney. Martin Jones, our Funding Officer, will be joining the event to share his insight and experiences when it comes to raising money for your cause. 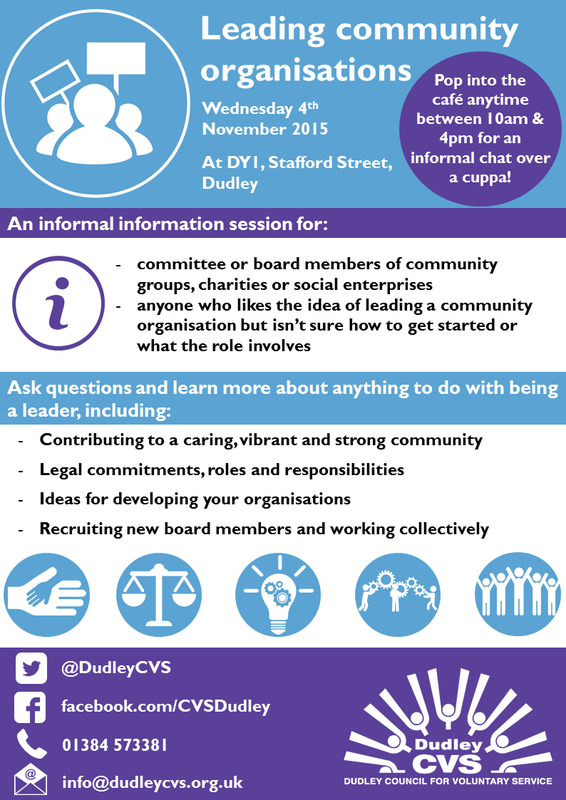 The event will be held at DY1, Dudley, 10am-12noon. And finally! Friday 17th June is Volunteering Day – Eileen is planning a networking and support event for local small charities, including social enterprises, who involve volunteers. There’ll be an opportunity to meet new people, build connections and find out who’s out there to support, with hints and tips on the best way to involve volunteers. The event will run from 10am-12 noon. If you’d like to join this event, please book your place on Eventbrite. We hope you’ll be able to join some of these activities and join us in celebrating the wonderful work our small charities do day in, day out.